Look at all that wide open space! 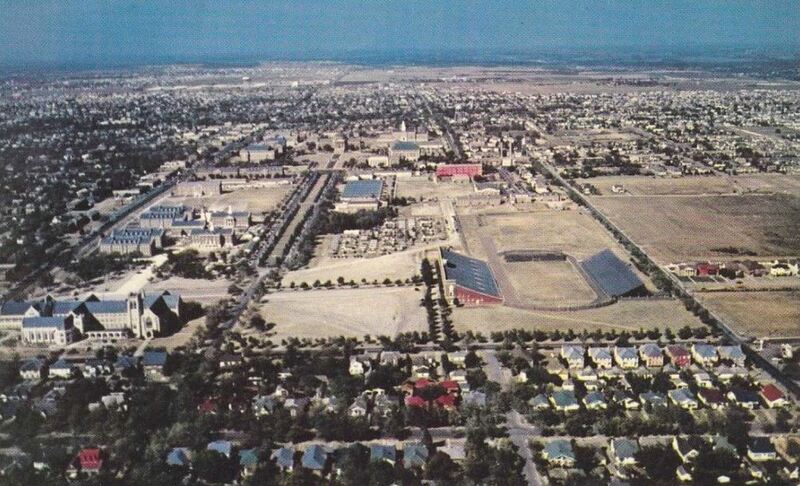 This undated postcard — captioned on the back “Southern Methodist University Campus And Owen [sic] Stadium From The Air, University Park, Dallas, Texas” — is for sale here. What many of us think of as Ownby Stadium began life as the much smaller Ownby Oval, named after SMU alumnus Jordan Ownby who had donated $10,000 toward the construction of the new stadium. 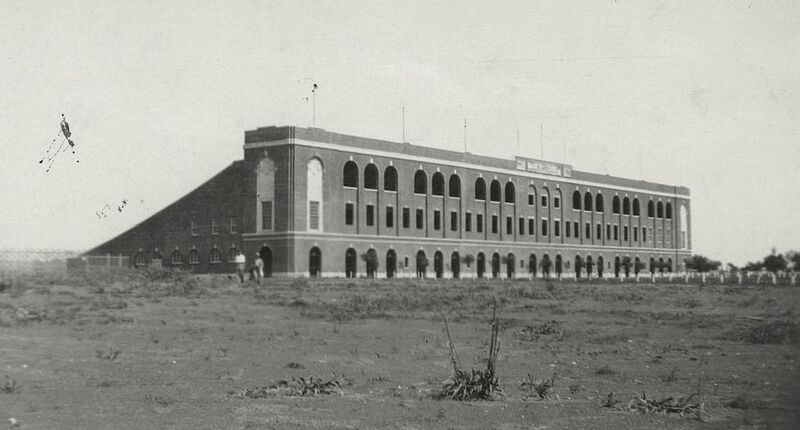 The oval was dedicated on Oct. 10, 1923 during its inaugural football game in which the SMU Mustangs defeated the Austin College Kangaroos 10-3. Info and specs can be found in this captioned drawing that appeared in The Dallas Morning News on July 23, 1923 (click to see larger image). 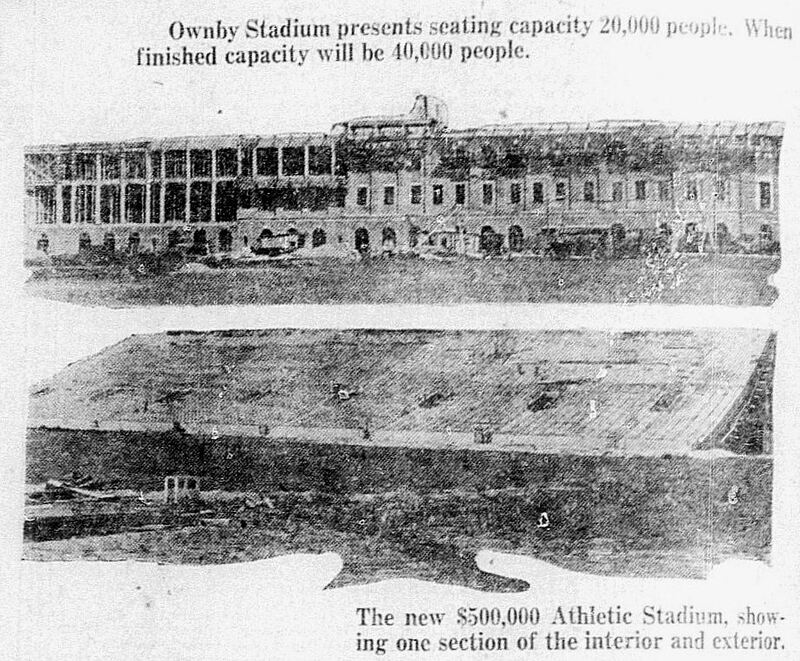 The first phase of Ownby Stadium — much enlarged and improved from the old 8,000-seat oval — was built in 1926. The two steel stands from the old field were moved to form the temporary east section of the new stadium, and a new $190,000 “west unit” (designed by Dallas architects DeWitt and Lemmon) was built, adding more than 12,000 seats. 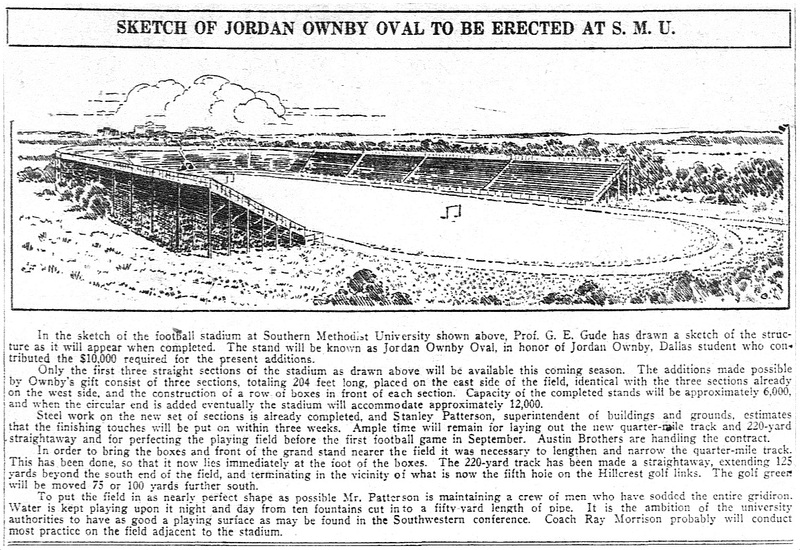 Jordan Ownby Stadium was formally opened on Oct. 2, 1926 during half-time ceremonies of the football game between SMU and Trinity University (SMU won, 48-0). Here’s a scrubby, somewhat desolate photo from 1927, taken by Joseph Neland Hester, from the DeGolyer Library, Central University Library, Southern Methodist University; more info on this photo can be found here. The new stadium was even featured in an ad for the University Park Development Co., which used the ever-expanding SMU campus as a selling point to attract potential investors. Photo taken after color photography was introduced, but before the shopping center on the N.E. corner of Airline and Mockingbird was built. I remember that shopping center back to about 1966 or so, so it’s clearly before then.Too bad the picture doesn’t go far enough to the East to tell if Mrs. Baird’s is there or not. Color photos have been around for a long time. The first natural color photo appeared in National Geographic in 1914. Kodachrome was introduced in 1935. Also the photo could have been hand colored. So the photo was most likely taken in the 1940s.